Residential Electrician: No Job Is Too Small! Homeowners in Allen, Texas trust Nisat Electric! Nisat Electric is the top choice of many homeowners because Residential service is our specialty. 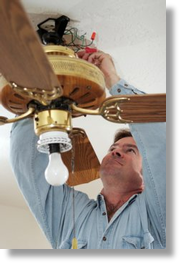 Our Master Electrician provides the same high quality service in your home as he does in his own. We take great pride in offering reliable, honest service at affordable prices throughout the North Texas area. Do-It-Yourself Electrical Projects Can Be Dangerous! Not only are you at risk of serious injury or death, when DIY projects are not done right they end up costing you more money. Take care of yourself and your investment in your home by hiring a professional electrician. We will work with you every step of the way to ensure that you have peace of mind. Before you hire someone to complete electrical work in your home, please take a few minutes to review testimonials from Nisat Electric customers as well as electrician licensing regulations and Nisat Electric's licensure in the State of Texas. Our Master Electrician is proud to maintain three licenses including Electrical Contractor, Master Electrician and Journeyman Electrician. Call Nisat Electric at (214) 809-9988!